One of the landmark of Seoul - Namsan Seoul Tower ! How to go to Namsan Seoul Tower? Go to Chungmuro 충무로 subway station (line 3 or 4) and then go to exit #2. Wait for yellow bus (bus no. 02) at the bus station in front of exit #2 and get off at Namsan Seoul Tower. The Teddy Bear Museum has 2 exhibition hall, the past & present. 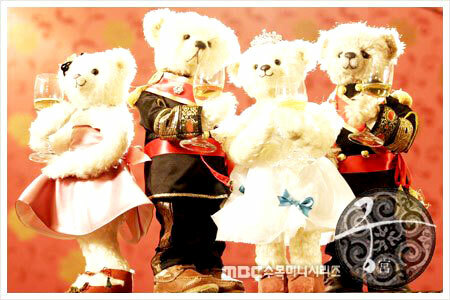 It's the teddy bears for Princess Hours drama !! Shin Chae Kyeong & Lee Shin ! And after Teddy Bear Museum, let's go to the observatory ! ah~~ Japan is that way! But anyway, i found an activity at the observatory area ! If the postcard is available with stamps, just stick the stamps & put KRW200 inside the plastic of the postcard if you want to mail it to overseas. If the postcard is not available with stamps, put KRW400 inside. This is the toilet. But yeah, because it's foggy and cannot see view, so it is not that wow. But i think it is very cool when you can see the view clearly! This is like a block where you can write something, but you should buy the block first. Yeah !! Locks of Love ! Where you can write something on your lock or if you have couple, buy a couple locks and write your love writings. Then lock your locks somewhere here and throw away the keys so that your love is secure forever ! ok that's all this time !